Are you presenting some important data values on a slide? KPI numbers, company fact sheet or sales campaign numbers? Learn how to present numbers in creative, strongly visual way, that will make your presentation outstanding. We put together a bunch of slide designs for situations when you need to show a few critical values that should attract all eyes in the room :). You can be preparing a slide where you want to focus on a few important numbers and you don’t want to use standard charts. In such a case, try to use some simple PowerPoint infographics shapes. You can put there your three most important Key Process Indicators. Or basic information about your company (number of clients, employees, turnover…). Or extract of your balanced scorecard measures. We designed a set of flat style diagrams and geometric shapes that can serve as perfect visual placeholders for your key numbers and a short explanation. All diagrams are PPT vector shapes, so they are fully customizable (colors, shape, outline, remove or duplicate items) in a few seconds. They require no artistic skills to adapt to your needs. Use it as an inspiration how you can present a formal data in the unique visual way. Graphics we applied in this slide deck follows modern Metro UI graphical style (popular especially since MS Windows 8 used it). 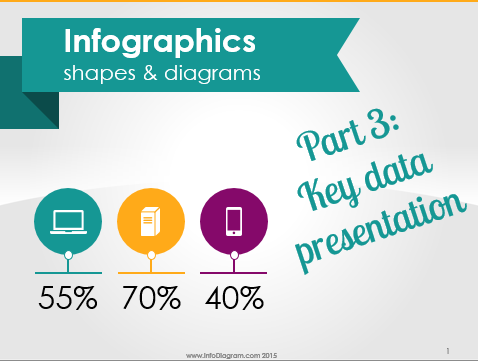 Those diagrams are easily redo-able in PowerPoint, Keynote or other presentation software. PS. What’s your challenge showing numbers? Comment below. I will be glad to give you some design ideas. My challenge is that I need to show full big data table on a slide and then talk about its details. Robert, if you must show a data table on a slide, consider splitting it into more slides. This will allow you to make the font bigger and more readable. If you don’t want to split, e.g. because you want to show all data in one place, use at least narrow font (e.g. Calibri Light or Arial Narrow) avoid wide fonts such as Verdana, Tahoma. And add margins to all table cells. Consider highlighting the key data from the table. Use high contrast cell background or some kind of marker graphics over the table. Are there common slide formats that are used in different settings for maximum impact. Thx for asking. If you mean slide size formats, now there are two common sizes – older classical 4:3 format and newer wide 16:9 format. Which one to choose depends on how you want to use the slides. The wide ones fits better the wide screens – so for making presentations to be read on monitor. It also gives more space for content design. On other side the 4:3 format is more suitable if you want to print slides, it’s easier to fit e.g. 2 slides on one sheet of paper.